Except under special circumstances, the Federal Communications Commission (FCC) does not conduct much frequency monitoring activity. I know first-hand that even when a report of radio frequency interference (RFI) is made to them, you will be told to figure out the source on your own and then get back to them*. There have been a lot of news items lately where the FCC has levied heavy fines on Ham operators found to be in violation of the regs, and usually not because of independent complaints. 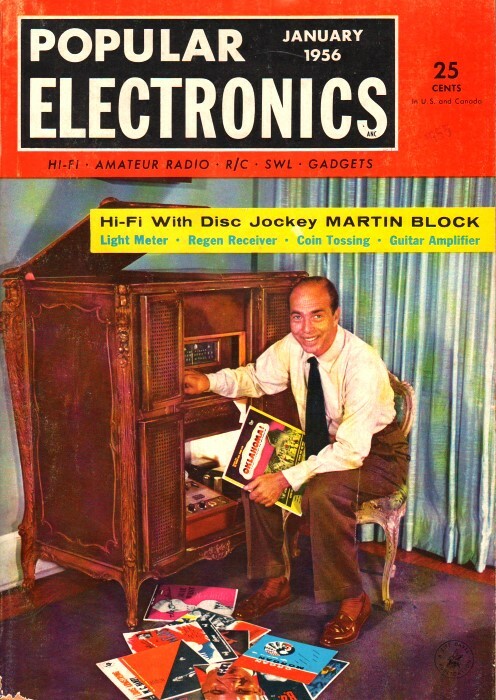 This article from a 1956 edition of Popular Electronics relates some of the cases experienced by guys in the FCC Field Engineering and Monitoring Bureau (defunct, see item 13.). * Sometime around 2005 I began noticing severe interference on my car's AM radio receiver in a relatively small area. It was noticeably worse on rainy or humid days. I finally traced the problem to a faulty 3-Ø transformer that serviced some guy's home garage (unusual in itself since typically personal residences cannot get 3-Ø service). I was able to see one of the phases arcing at the ceramic insulator. A call to the power company got the problem fixed, and the lineman actually called me back a said it was so bad that he was surprised a nearby tree had not caught on fire because of it. The FCC never got involved. Radio has become so widely used, and so essential for communication, that any illegal operation or harmful interference must be detected speedily and the violators dealt with. More than 700,000 transmitters are operated in this country, with nearly 975,000 operator permits outstanding. Ninety-eight percent of the nation's homes contain broadcast receivers. Policing this busy radio activity is a 24-hour-a-day job for FCC monitors. These typical cases were reported by the FCC Field Engineering and Monitoring Bureau in connection with its monitoring and investigative work. An obliging dentist recently demonstrated an electronic device to induce local anesthesia for tooth extractions. However, the spark-gap oscillator he used could be heard in a mobile unit under power lines about a mile and a half away. 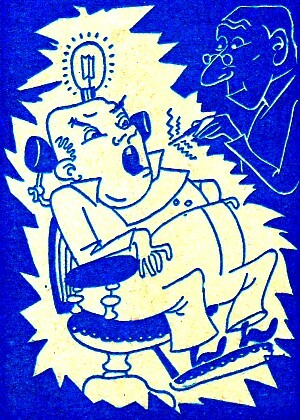 Moreover, a neon bulb glowed brilliantly when held within 18 inches of any part of the patient, indicating radiation from the body. Closer physical contact caused actual sparks. All this convinced the dentist that his equipment should be used in a shielded room - whenever he can get patients to try it. In Kansas City, a 17-year-old radio enthusiast played phonograph records over a home-built transmitter under the mistaken notion that they could be heard only on his friend's receiver next door. He was surprised to learn that the signals were going much farther. After being told that his transmissions might obliterate radio messages used for safety purposes, he agreed to abandon his "short-range broadcasting" and direct his efforts toward obtaining an amateur license which would enable him to talk with "hams" the world over. 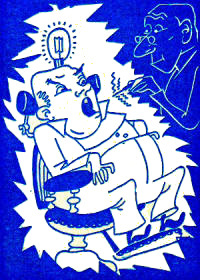 A young "Marconi" in Ohio requested permission to use an old-fashioned spark coil. He explained that he knew it was unlawful to transmit by radio without a license and for that reason proposed a "wireless" instead of a "radio" station. He was told that "wireless" is just another name for "radio" and that spark coils, which cause great interference, have not been authorized for years. While moored at a lumber pier at Long Beach, Calif., a cargo vessel caught fire. The night watchman aboard ran to the nearest shore telephone some distance away only to find it out of order. However, the driver of a passing radio-equipped taxicab saw the blaze and reported it by radio to his supervisor, who in turn summoned the fire department. This action saved the fire from spreading to the lumber, and the ship is now back in service after relatively minor repairs. Despite the mushrooming of Television Interference Committees under FCC auspices to tackle broadcast reception problems at the local level, TV viewers in a certain California community were not convinced by the local TVI committee that their interference was due to receiver deficiency. They blamed their interference on a local amateur station. They even threw rocks at the home of the ham. But peace was restored when an FCC engineer explained at a subsequent neighborhood meeting that filters connected to poorly shielded TV receivers would overcome the difficulty. Investigated by FCC field men recently was an alleged "electronic bug killer." A small box was supposed to emit a ray which so affected the antennae of the insects that it would drive them away. 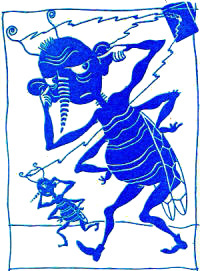 The demonstration indicated that there was no release of energy, only of sound which was calculated to annoy the bugs. While monitoring for interference in Portland, Oregon, an FCC mobile unit observed a strange signal which was traced to an apartment house. It was found to be due to a home-made short-wave receiver which had been discarded for two years. Unknown to the owner, however, the power cord was still plugged in with the switch "on." This combined fire and interference hazard was promptly remedied, but the owner is still trying to determine how much it cost him on his electric bill. As a practical joke, a licensed amateur sent a "questionnaire" to a prospective ham, asking such questions as: "Are you familiar with the penalty for violation of FCC rules?" The startled recipient promptly filled it out and, assuming it was from the FCC, mailed it to Washington, D.C. The face of the jokester turned red when the prank turned on him. Investigation revealed that he had sold a transmitter to his friend and the latter had gone on the air without a license. Both were warned, and the offender has now obtained a Novice license.